The 25th anniversary of the fall of the Berlin Wall is on Sunday, Nov. 9. 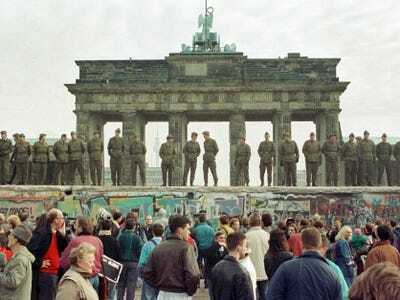 The fall of the wall quickly led to the reunification of East and West Germany, after 45 years apart. But what many people don’t know is that as the Soviet Union lost control over daniast Germany, a series of political events meant that the construction of the euro accelerated dramatically. He had said to them that no doubt Germany could if it wished achieve reunification, bring Austria into the European Community and even regain other territories which it had lost as a result of the war. They might make even more ground than had Hitler. These attitudes seem astonishing in hindsight. We now think of the collapse of communism as a joyful occasion, but the French president genuinely thought it could spark off another war with Germany. In the end, Mitterrand realised that reunification was not really optional: but that the quick integration of Germany into a shared monetary system would blunt any lingering nationalism that a large, strong Germany might have. A consensus has emerged that German unification made EMU inevitable… German unification did not cause Maastricht but instead accelerated the German government’s tilt towards EMU… the German government saw the utility of surrendering the deutschmark and its role as hegemon provided that it could act as the architect of the new monetary system. And that’s basically what happened. The Bundesbank, more than any other monetary authority in Europe, built the culture of the new European Central Bank. That’s part of the reason that the ECB is now behind the curve seemingly all the time. In 1998, future German chancellor Gerhard Schroeder said bringing in the euro too quickly would cause it to resemble a “sickly, premature baby”. And when the crisis came, it did. Without the fall of the Berlin wall, West Germany may not have ever consented to the EMU (or the eurozone). The project would have got underway much later, and taken a much longer period of time, or never happened at all. No EMU, no eurozone, no euro crisis.